Last night I was introduced to a whole new type of beer, and by total chance. I've drunk Kriek before, quite a few beers that have very fruity notes, but I've not had a straight up fruit beer. On many occasions I've passed them by on supermarket and beer shop shelves, always with the opinion that they'd be overly sweet and just a bit naff. 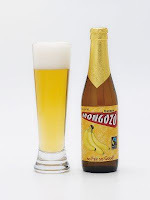 With a couple of guys from work, for no real reason, we ordered several Mongozos at a local Belgian beer pub. I'm pleased to say that I was right. They are naff, overly sweet and in your face. There's no real complexity to the flavour, no depth, they don't even taste like beer. Despite this however, they're delicious! What starts with a sweet and fruity nose, begins with a sweet and fruity taste and then ends with a (you guessed it) sweet and fruity finish. The thing is, if you're in the mood for sweet and fruity, they're just so damn tasty. At 3.5 percent and served chilled they're also mightily refreshing. 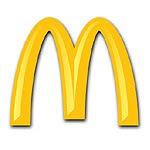 This reminds me of McDonald's. Take the humble Big Mac. It doesn't try to be craft or artisan, nobody's going to spend time dissecting it and analysing it's flavour profile. But there are certain times when there's nothing I fancy more than a Big Mac and fries. It's beef in bread with a tangy sauce. It's honest and, when you're in that frame of mind, it's delicious. For me there's absolutely nothing wrong with that. Fruit beers. The Big Mac of the brewing world. Perfect for those few occasions when you know exactly what you want. Summer evenings that follow roasting hot days, when you want something cold, refreshing, sweet and fruity.